Is par for the course still good enough? 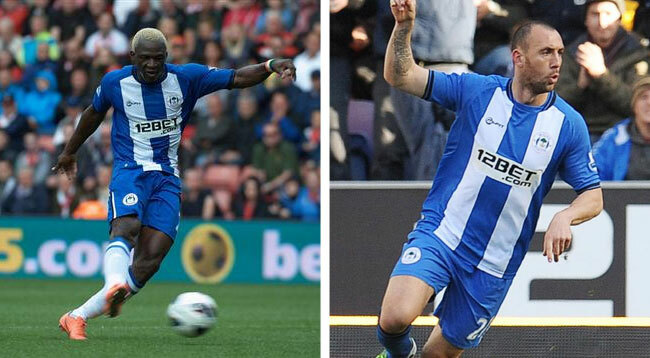 Last November, Wigan Athletic were bottom of the Premier League with just 5 points from 11 matches. At present, they lie in 14th place with 11 points, averaging a point per match? If they were to maintain that point rate through the season, they would end on 38 points, usually enough to stay up. But is staying up sufficient for Wigan Athletic supporters and its management anymore? Lets look back on the season so far. The team has won 3 league matches out of 11. With the exception of Ivan Ramis and Arouna Kone, this is the same nucleus that won 7 out of their last 9 games last season against stronger opposition. So why have they not done better? It cannot be put down to Ramis and Kone. Apart from his difficult Premier League baptism against Chelsea, Ramis has been solid, getting better game by game. Despite speaking almost no English he has become the de facto captain in the absence of Caldwell. Given that he was previously captain of RCD Mallorca for several years, it is no surprise. Kone has made an excellent adaptation to English football. Strong, speedy, skilful and unselfish he has already 4 league goals – Moses only scored 6 in the whole of last season. Both are excellent signings. Moreover Martinez has moved on with his tactical formation without the maverick Moses (exciting, but frustrating) to be able to play with two big strikers and a mobile playmaker. Over these past years one has seen Wigan Athletic teams that have been either disorganised or short of a real game plan. That cannot be said of the current team, who play within a well-created tactical system that can pose problems for even the finest of Premier League teams. Moreover, the players know their roles and show a high degree of commitment. Roberto Martinez talks about this being the best squad he has had – and given the budget he has to work under, he has done a marvelous job at recruiting the players at his disposal. So why are Wigan Athletic not at least in mid-table position at this stage? You could blame referees or say they have had some bad luck and there is validity in such arguments. However, so could many other clubs stuck in the lower reaches of the table. Losing at home to Chelsea with their wealth of talent is not going to be a surprise, but home losses to potentially mid-table teams like Fulham and West Bromwich is hard to take. Both matches were characterized by giving away soft goals and a lack of finishing. The old failings continue to haunt. Player-for-player, neither Fulham nor West Brom is superior to what Latics have, except maybe Berbatov for the Londoners. However, what both those teams have is a deep-rooted self confidence, which Wigan Athletic just don’t seem to have. Roberto Martinez has put together a team that could beat any team in the division on their day – a remarkable achievement. His players are largely international journeymen or players who have come in from weaker leagues. Nevertheless they have the skills to compete with the best. Whether he can instill that kind of self-belief in his players, like those in the higher-placed teams continues to be his challenge. He has done everything else really well – a superb tactical system, motivated players – but is it within his powers to convince his players that they can be as good as those earning two or three times their salaries in the Premier League? Without that, Wigan Athletic are going to be involved in yet another relegation dog fight.